Miami has a reputation as a place that is supportive of adventurous architecture. It is home to several firms building internationally and its property developers understand the branding value of affixing design stars’ names to buildings. It has, of course, been known for its winter holiday architecture going back to the 1920s and architects, for their part, seem more than willing to still build there and take a whack at a glass tower channeling South Florida’s blue sky’s, aqua water, and relaxed lifestyle. There is a building—known as Office in the Grove—that represents this earlier Miami aesthetic and, with its fate is uncertain, Docomomo US/Florida is asking for it to be designated as a historic architectural resource. It’s is an eight-story hexagonal, concrete tower floating over a three-level, grass-landscaped pedestal and it’s an example of that homegrown Miami style. It was designed in 1973 by the important Florida modernist Kenneth Treister, whose buildings are important in the urban landscape of South Florida, particularly in Miami and Miami Beach. Lejeune argues that the concrete style (arguably refined to its finest expression by Paul Rudolph on the west coast of Florida) intended to create openness in public buildings while responding architecturally to the climate, and is part of a larger argument about the style known as Brutalism. There quite a few of these public projects still in existence scattered around Florida. However, they are increasingly under attack as no longer relevant and are being reconfigured.Lejeune points, in particular, to The Miami Dade College campuses (1961) by Pancoast-Ferendino-Grafton-Burnham (with Hilario Candela as primary designer) as well as William Morgan’s Police Memorial Building (1971-75), both of which are in excellent condition. The explanation of how Brutalism was meant to be an expression of the notion of the public may be hard to understand today but was based on notions like patios, open air-circulation, monumental public entrances, and sheltered loggia “assertively conveying a nobility of public service in behalf of the law” as architect William Morgan wrote about his Federal Courthouse in Fort Lauderdale (1976-79), now threatened. Lejeune points, in particular, to The Miami Dade College campuses (1961) by Pancoast-Ferendino-Grafton-Burnham (with Hilario Candela as primary designer) as well as William Morgan’s Police Memorial Building (1971-75), both of which are in excellent condition. The explanation of how Brutalism was meant to be an expression of the notion of the public may be hard to understand today but was based on notions like patios, open air-circulation, monumental public entrances, and sheltered loggia “assertively conveying a nobility of public service in behalf of the law” as architect William Morgan wrote about his Federal Courthouse in Fort Lauderdale (1976-79), now threatened. As a commercial office tower, Office in the Grove is not a public building, yet it is significant for its conveyance of ‘publicness.’ This, along with many other respects, qualifies it for designation as a landmark. Besides its substantial street presence (at 2699 S. Bayshore Drive) it is among the first buildings to be constructed of post-tensioned concrete slabs and a completely prefabricated concrete facade. It features an important integration of architecture and landscape and is a building that integrated art into its concrete surface with styled period images of the Everglades. 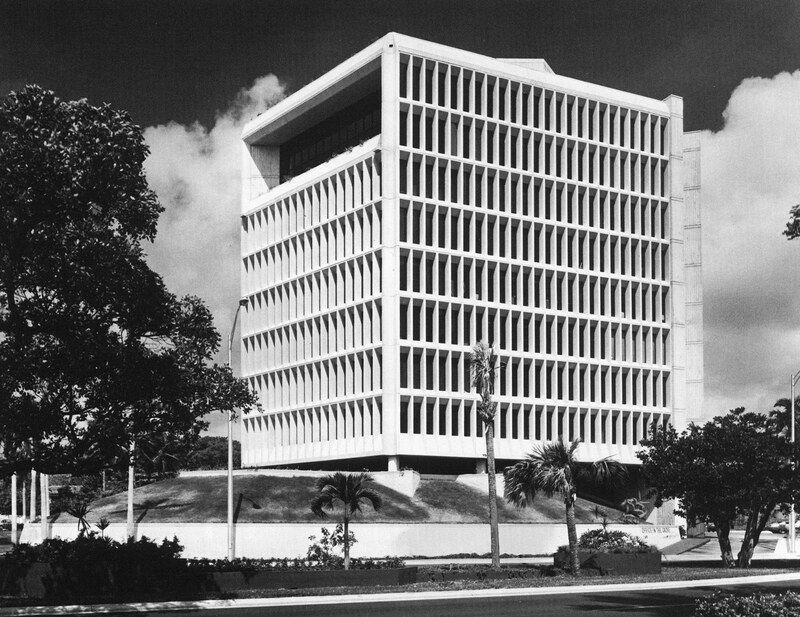 According to Docomomo US/Florida, “this was Miami’s first office building to give the community an eye-level, landscaped grass berm as its facade.” Office in the Grove also is one of Triester’s best buildings and it would be a tragedy if it is left to the fate of developers. The hearing is September 5 and we will report on the application to preserve this important work of architecture. It will be held at the City of Miami Historic and Environmental Preservation Board’s hearing at Miami City Hall, 3500 Pan American Dr., Miami, FL 33133.